Longing for blue skies, sunshine, and teal ocean waves washing over pristine sand? Florida’s Gold Coast is just the ticket. 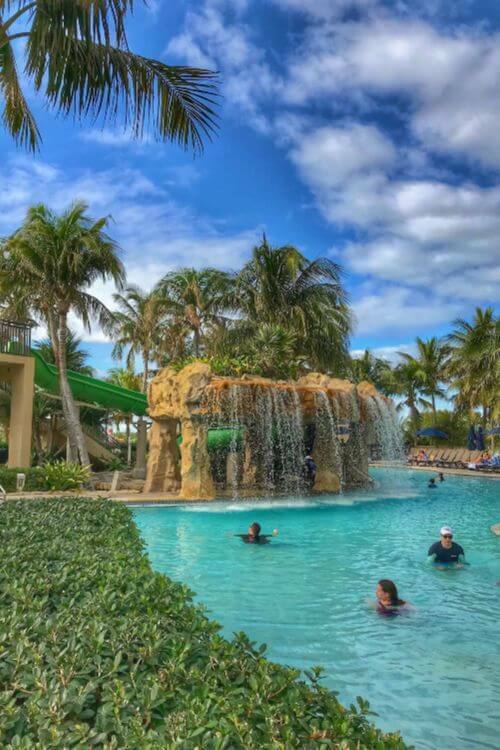 Kids Are a Trip contributor Heidi Gollub spent a luxurious week at Palm Beach Marriott Singer Island Beach Resort & Spa in South Florida, where she reports it was 85 degrees in February and she never wanted to leave. 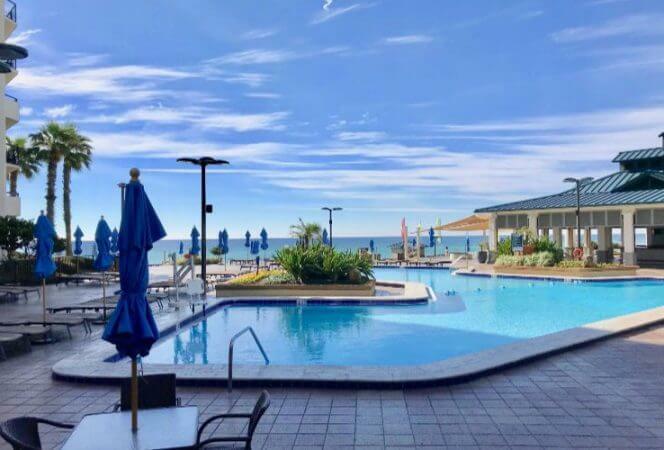 Read why she thinks this resort is the perfect destination for families looking for a respite from winter weather. Disclosure: Our contributor received one complimentary night stay and spa service. All opinions are her own. Thank goodness South Florida opts out of winter. I had had enough of gray skies and wintery winds when I packed my bathing suit and hopped on a plane bound for The Palm Beaches. 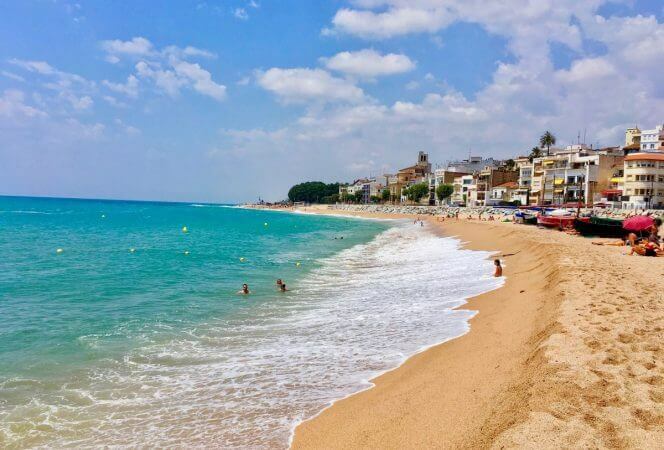 Year-round sun and warm ocean water? Yes. Please. Count me in. After landing at Palm Beach International Airport and renting a car, it took a mere 20 minutes to reach Palm Beach Marriott Singer Island Beach Resort & Spa. I rented a car thinking we would explore The Palm Beaches, but nope. The resort had everything we were looking for in a vacation: food, fun, sand and shells. We barely left at all. In fact, at the end of our trip, it cost me exactly $3 to refill my rental car tank. The Marriott was paradise—we were happy just hopping from pool to jacuzzi to ocean, and back again. 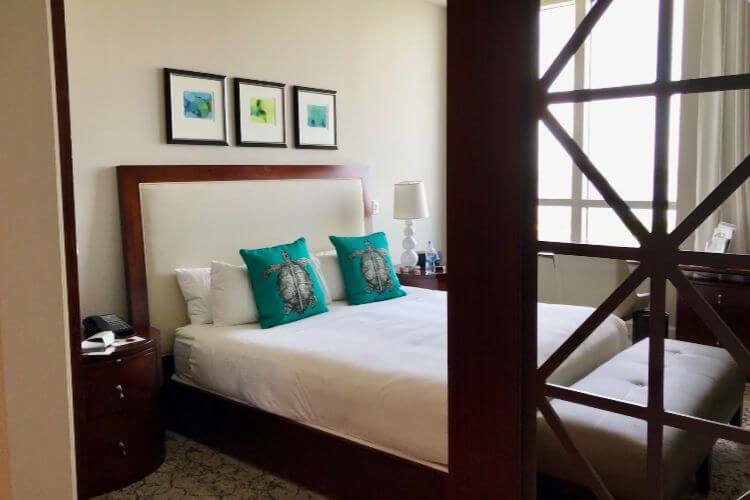 When we checked in to our two-bedroom suite at Marriott Resort Palm Beach Singer Island, we were blown away. It was 1,200 square feet—the size of a small house. With a huge living room, kitchen (complete with oven, microwave, full-size fridge, Keurig, dishwasher, pots, pans, and dishes), washer and dryer, and two large bedrooms with en suite bathrooms, it felt move-in ready. There were even three televisions, although there was so much to do at the resort, we couldn’t imagine taking the time to sit and watch them. When the sun rose the first morning, we immediately opened our balcony doors to hear the ocean below. We couldn’t wait to get down there. Since the hotel has a private beach, there were only a few beachcombers out strolling. And the sea shell hunting was delightful—I collected a beautiful pocketful of souvenirs. Then, after grabbing breakfast in the lobby café, we went straight back to the ocean to explore some more. We tried all of relaxing options. I was surprised to discover just how much I loved having beach lounge chairs to call our own. I sat and read my book under the umbrella and simply raised a flag when I wanted a waiter to deliver one of those free drinks. When the afternoon wind picked up a little, we headed to the heated infinity pool and jacuzzi overlooking the beach. Nearby, there were cabanas for relaxing and poolside games like corn hole, ping pong, Jenga, and ring toss. On the other side of the hotel was another heated pool, with a beach entrance, two-story waterfall and waterslide. We headed there next. This was where most of the families were hanging out. If you’d like your children to enjoy some special time on their own at the resort, the Kids Club offers a wide array of activities. Kids Club has daily sessions from 9 a.m. to 4 p.m. ($75 with lunch included) and Parents’ Night out on Friday and Saturday nights from 6-10 p.m. ($55 for ages 5 to 12 years old). Or, you can just drop in for special activities—some are free (bean bag toss, potato sack race, freeze tag, hula hoop, seashell creatures, finger painting) and others cost as little as $3. On weekends, there are featured events like Resort Bonfire Movie Night and Stars and Night Sky Program. Be sure to pick up a Kids Club schedule when you arrive. And of course, parents like special time too. I had a hot stone massage at the resort’s Si Spa that was to die for. I arrived at the spa early to indulge in the 118-degree steam room (heaven!) and then melted into a puddle during my 50-minute massage. Afterwards, I soaked in the spa’s private outdoor jacuzzi and felt well and truly like a different—more relaxed—person. It was dreamy. Here’s a tip: Check Groupon for discounts and then book your treatment in person at the spa. They will honor the Groupon rate and you can add the treatment at the discounted price to your hotel room. You’ll be so glad you did. There are several restaurants at the resort, ranging from casual to sit-down. 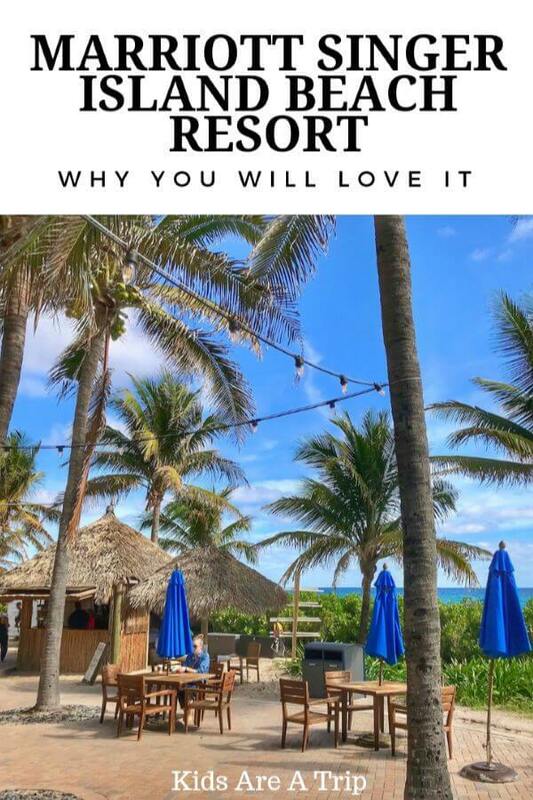 My favorites were the very laid-back Lagoon Cantina Bar & Grill by the Lagoon Pool (although it closes early, so be sure to order before 4 p.m.), the oceanfront Reef Tiki Bar and Grill, and the Ocean Breeze Café in the lobby, which was perfect for breakfast on the go. 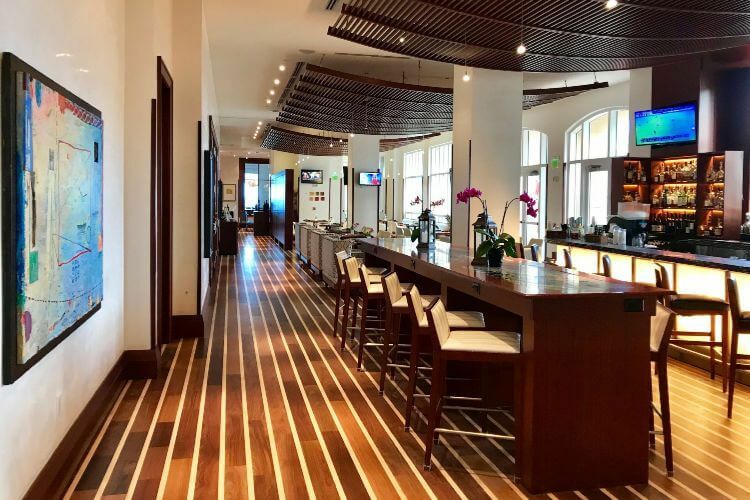 For fancier fare, you can dine at the 3800 Ocean restaurant, which offers freshly prepared cuisine made from scratch using local ingredients. On this trip, we were happy to spend our days lazing about the Marriott Resort Palm Beach Singer Island. But, I know from a previous trip to the area that there is plenty of family things to do in The Palm Beaches. If you’re looking for a little extra entertainment, here are a few great options. 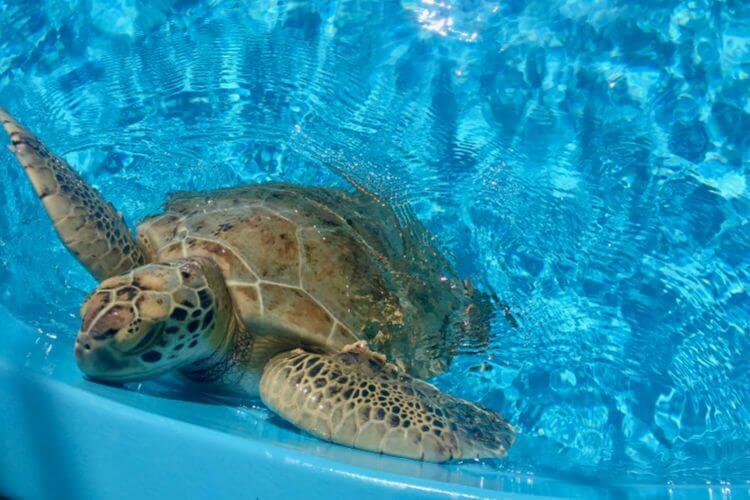 Admission to this sea turtle rehabilitation hospital is free, and offers the opportunity to watch ocean conservation in action. Located 12 minutes north in Juno Beach—one of the most densely-nested loggerhead turtle nesting beaches in the world—Loggerhead Marinelife Center introduces guests to threatened and endangered sea turtles. From new hatchlings to older turtles being treated for injuries, a variety of animal patients are on display in open outdoor tanks. Children are also invited to attend Junior Research Lab, a free hands-on program that teaches junior researchers how to find, identify, and care for turtle hatchlings, before releasing them back to the wild. Lion Country Safari in West Palm Beach is another great attraction for animal lovers. Start your day with a four-mile drive-through safari with more than 1,000 exotic animals. You’ll see wildebeests, black buck, and the largest herd of zebras outside of Africa. Be sure to ask for an educational audio CD, to accompany your tour. Then, park and head into Safari World Amusement Park where interactive animal encounters await. 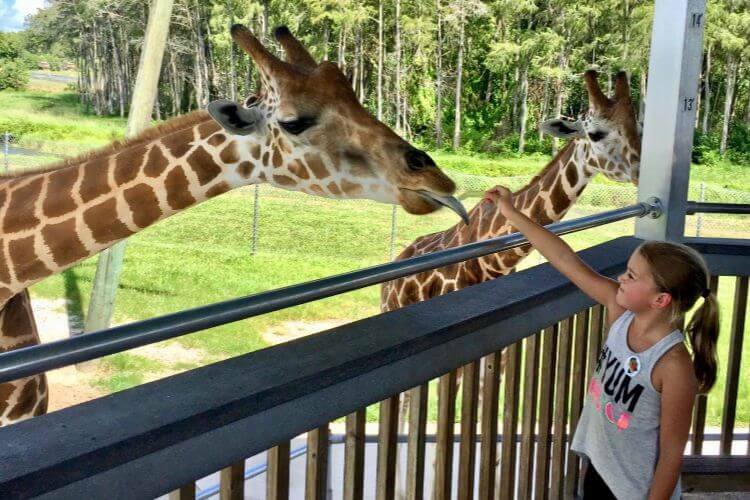 Feed giraffes, lories, and fish, watch flamingos, and visit the petting zoo. Spend the afternoon enjoying the park’s many free attractions, including a mini train, paddle boats, mini golf, and splash pad. The South Florida Science Center & Aquarium is a great place for kids to burn off steam and get their creative juices flowing. Hands-on learning experiences include a water room, interactive shadow room, and an “amazing butterflies” maze of activities. Outside, kids can make bubbles, play on the playground, and try a round of mini golf. 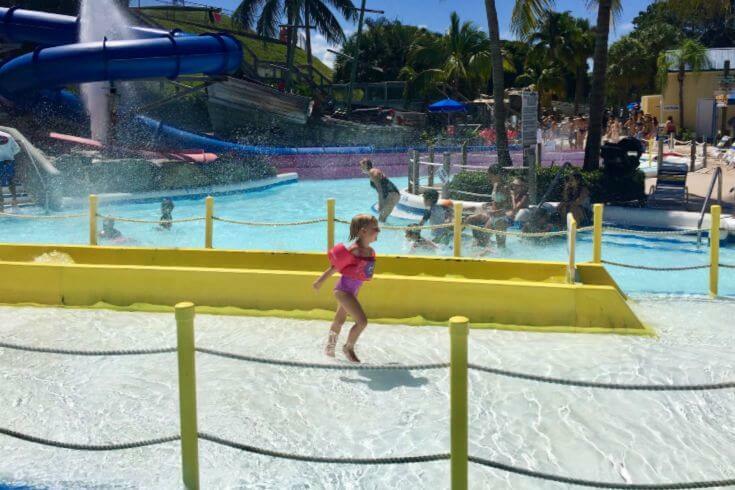 If you visit the Palm Beaches in March or later, be sure to visit Rapids Water Park for a few hours. South Florida’s largest water park has 30 acres of fun, including 35 water slides, a wave pool, and a relaxing lazy river. From the Splish Splash Lagoon, where the three slides have no height restrictions, to Splash Hill’s eight slides with a minimum height requirement of only 36 inches, this park has something for everyone. Ready to plan your getaway to Florida’s Gold Coast? 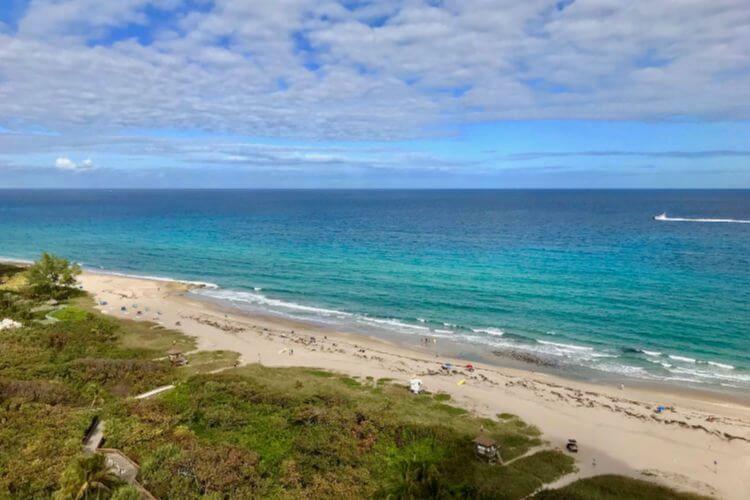 Start by checking out Marriott Resort Palm Beach Singer Island, the only all-suite beachfront resort in Palm Beach County. It’s the perfect hotel to host your family’s winter escape! Looking for other family friendly resorts in Florida? Don’t miss this this property in Sandestin or our favorite resorts in Orlando for families!